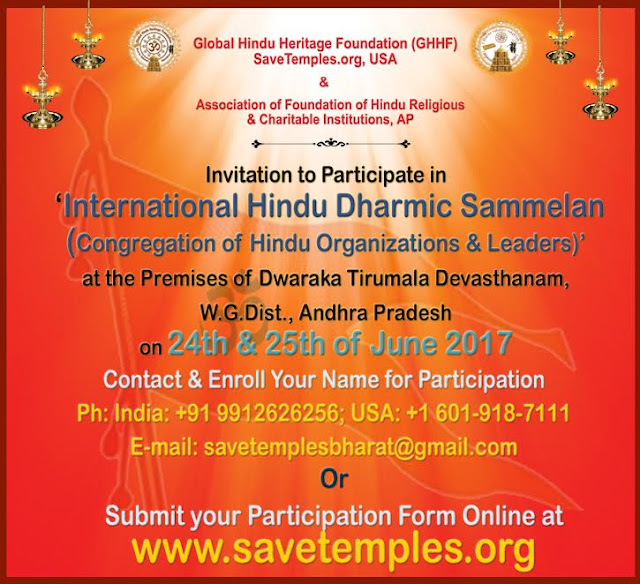 Global Hindu Heritage Foundation (GHHF), Savetemples.org and Association of Foundation of Hindu Religious & Charitable Institutions, Andhra Pradesh combinely organizing an “International Hindu Dharmic Sammelan” at Dwaraka Tirumala, West Godavari Dist., Andhra Pradesh on 24th & 25th June 2017 said by Chairman’s of organizations Prof. Velagapudi Prakasarao & S V Sudhakar Rao. Sri Subrahmanya Swamy, Member of Parliament will grace the Sammelan as Chief Guest and So many Peethadhipathi’s and Hyndhava Sears, Representatives of various Dharmic Associations from different countries all over the World are participating in this Dharmic Sammelan. The Sammlen will discuss about the Restoration of ancient temples, Introduction of Latest Technology into Temples Administration & Protection, Safeguarding sacred cow, Archaka Welfare etc. Artists from different parts of the country are participating in this Sammelan with Cultural programs in the evenings. Those who are interested they can call with their details to 9912626256 or E-mail their details to savetemplesbharat@gmail.com or they can register their participation through online at www.savetemples.org said by Dr. Ghazal Srinivas, Brand Ambassador, Global Hindu Heritage Foundation (GHHF), Savetemples.org.